NEW TRAILER FOR "MARVEL'S THE PUNISHER"
Netflix has dropped a new trailer and announced the release date for Marvel�s The Punisher. The show will roll out on November 17. The trailer focuses on the reasons Jon Bernthal�s Frank Castle became an armed vigilante, concentrating on a military conspiracy that dominates his past. Deborah Ann Woll, who played Karen Page in Daredevil and The Defenders, figures prominently in the trailer (see �Marvel's 'The Punisher' Expands Its Cast�). The release date announcement had been in limbo subsequent to the horrific mass shooting in Las Vegas on October 1. Netflix and Marvel decided to cancel Punisher-related events during New York Comic Con and in Paris out of respect for the victims and their families (see �'The Punisher' Events Cancelled�). 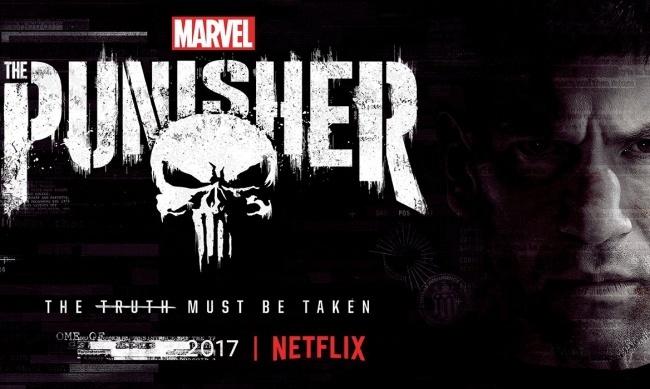 This isn�t to say there are no guns in the trailer -- this is The Punisher after all -- but by focusing on Frank�s past, Netflix seems to remain somewhat mindful of the catastrophe.